Photos related to Doctor who filming near Cape Town, South Africa have emerged from several Instagram accounts, including Mandip Gill’s, Tosin Cole’s, and the official Doctor Who account. It appears that the bulk of the filming occurred in a remote area of South Africa with access to both the mountains and the seashore. While the cast stayed in Cape Town, they were transported to a filming base daily, possibly situated in Table Mountain National Park. Quite a few scenes have been filmed on an unknown beach. One of the crew members in South Africa is assigned two episodes, 1 and 5, although numbering can change. Filming took place in South Africa for three weeks, ending the first full week of February. A night shoot on location for Doctor Who was scheduled for February 10 on the streets of Cardiff. I see the TARDIS!–do you? When a star is born, a chaotic light show ensues. NASA’s long-lived Hubble Space Telescope captured vivid bright clumps moving through the cosmos at some 1,000 light years from Earth. The space agency called these objects clear “smoking gun” evidence of a newly formed star — as new stars blast colossal amounts of energy-rich matter into space, known as plasma. 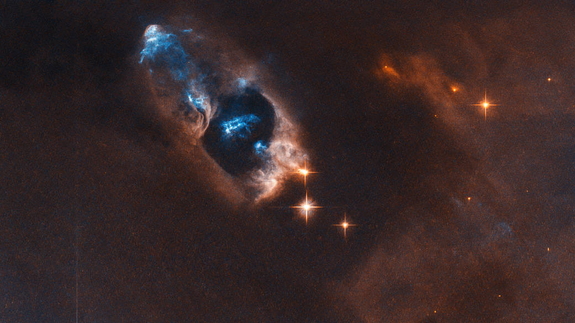 Seen as the vivid blue, ephemeral clumps in the top center of the new image below, these are telltale signs of an energy-rich gas, or plasma, colliding with a huge collection of dust and gas in deep space. These blue clumps are traveling at 150,000 mph toward the upper left direction (from our view, anyhow). In total, there are five of these ghostly clumps, hurtling through space. NASA doesn’t identify the new star itself, called SVS 13, perhaps because it’s obscured by thick clouds of cosmic matter. This collection of dust and gas is part of a distant nebula, which are often the remnants of exploded stars swirling through the infinity of space. For more holiday treats, check our blog posts from January 30 and February 13 of last year.